Ready to feel toned, healthy, full of energy and confident? Our bodies are always looking for ways to be healthy and nutrition is a key component of that. 80% nutrition and 20% exercise, so you are doing yourself a disservice and not getting the best benefits of your workouts with us if you're not cleaning up your eating habits. Did you know your body needs 92 nutrients a day? Where are they coming from? A balanced, healthy, convenient, nutritious diet and supplement plan will take you to a whole new level of goodness, and we’re here once again to meet you where you currently are in your health journey and help provide the tools for you to reach your individual goals. You can always find new recipes created by our favorite food developers in our Recipe Index. Using this as a guide will take the guesswork out of preparing healthy foods to help you make informed food choices in order to reach your optimal health and develop daily lifestyle habits that are sustainable and effortless. We've hand selected these recipes for their satisfying, delicious, and good for you factors. In a day and age where we are programmed to look at the calories and marketing schemes like reduced sodium and fat free levels (spoiler: they make up for it in yucky chemicals), we're here to reinstate a guilt-free, whole foods and real ingredients approach to fueling your body. 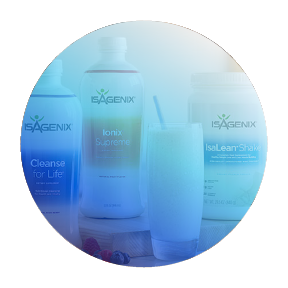 Isagenix is a simple lifestyle nutrition system with products that are redefining the health and wellness industry. Whether you’re looking to lose pounds, gain lean muscle, increase energy and decrease stress, improve performance, or combat the aging process and improve overall health, Isagenix has long-term health and fitness solutions for you! Their products are delicious and affordable, backed by science, all natural and non-compromise, free from soy, gluten, artificial flavors, sweeteners and colors, with dairy free/vegan options. They're only available from an authorized distributor like AFS - think of it as essentially an Amazon Prime wholesale account. It’s the perfect companion for a busy lifestyle without compromising a natural and healthy habits with a simple combination of whole food nutrition and cellular cleansing. We have witnessed thousands of life-changing transformations with clients, family, friends, and of course our own. We haven't gone a day without these products since we were introduced over a year ago.